A war-hardened Crusader and a Moorish commander mount an audacious revolt against the corrupt English crown in this thrilling action-adventure. Packed with gritty battlefield exploits, mind-blowing fight choreography and a timeless romance, this is the never-before-seen story of how Robin Hood became the icon and legend as we know him today. The 'Robin Hood' competition has now closed. Winners will be announced shortly. Competition opens at 5pm AEDT on Tuesday 13th November 2018 and closes at 11:59pm AEDT on Monday 19th November 2018. Five winners will be chosen at random on Tuesday 20th November 2018. To successfully win, entrants must fulfil the above entry conditions before the time the competition closes. Current members/followers are eligible to enter the competition. Only one entry per person. Only one winner per household. To be a valid winner, the entrant must not have won a prize from SWITCH within the last 28 days. 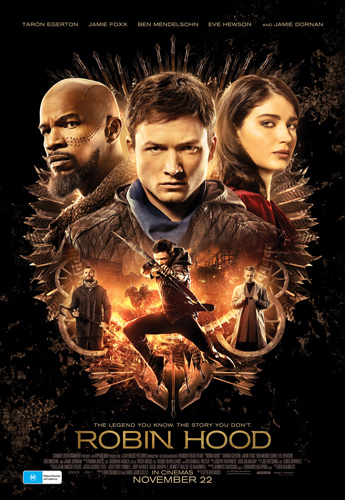 Each winner will receive one double pass to 'Robin Hood'. By entering, you agree to receive occasional emails from SWITCH in the future. If you decide to unsubscribe from these updates, any further entries will not be applicable. Only Australian residents are eligible to enter. 'Robin Hood' is in cinemas from Thursday the 22nd November 2018 through StudioCanal.